View of the Canberra Complex showing the 70m (230 ft.) antenna. Telecommunications technologies allow mission team members to send and receive data faster and in greater amounts. This image shows one of the Mars Exploration Rover Opportunity's first breathtaking views of the martian landscape after its successful landing at Meridiani Planum on Mars. It was the first image returned to Earth through the UHF communication link between the rovers and the Mars Odyssey spacecraft. On the left, the rover's mast can be seen in a stowed position. 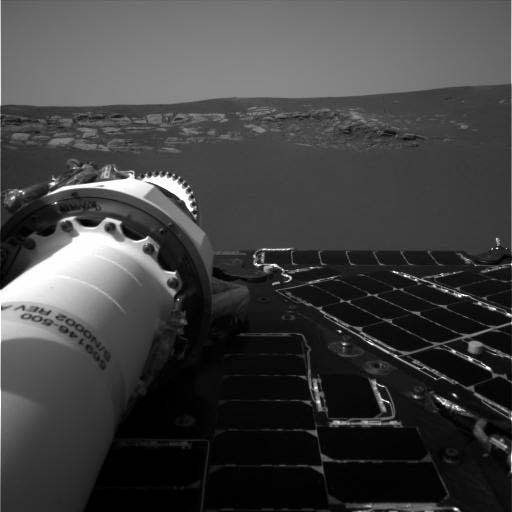 The image was taken by the rover's navigation camera. The rovers "talk" to Mars Odyssey, which is constantly orbiting the red planet. In the 16 minutes it takes the orbiter to go from horizon to horizon, the rovers and orbiter can "converse" for about 10 minutes. The vast majority of science data is being returned to the mission team on Earth through the rovers' UHF antenna, which communicates with Odyssey. Mars Odyssey has returned the majority of the data generated by both rovers. 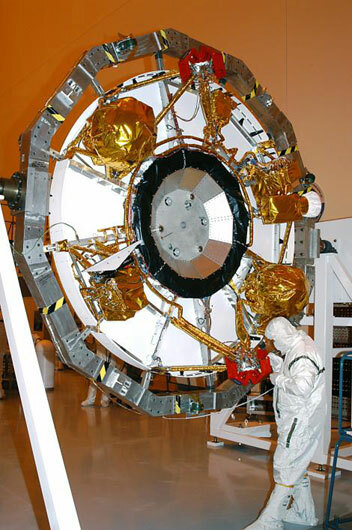 Another spacecraft, the Mars Global Surveyor, returned about eight percent of all data before the spacecraft stopped communicating with Earth in November 2006, following 10 years of operation. A small amount of data has been returned directly to Earth via the X-band link. 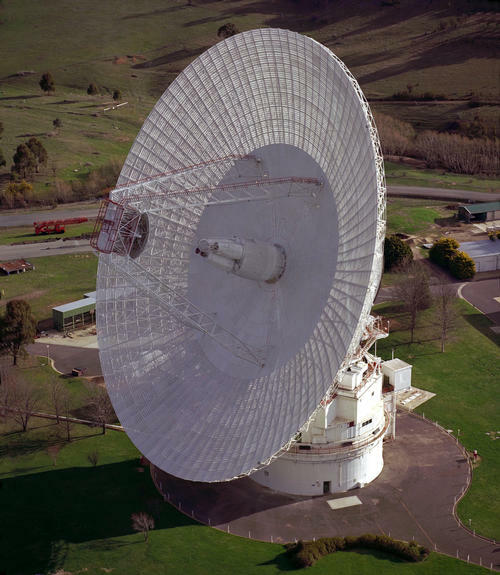 Orbiters with more capable X-band communications systems can transmit data to Earth at a faster rate. Their high performance is critical, as time on the large antennas here on Earth that were built to receive the data (the Deep Space Network) is limited given all of the spacecraft that rely on them. This cruise stage ring contains vital elements that led the craft safely to Mars, including propellant tanks and the cruise low- and medium-gain antennas. This image highlights the bottom of the spacecraft's cruise configuration - the shape it took until the aeroshell containing the rover separated during its entry, descent and landing phase. This cruise stage ring contains vital elements that led the craft safely to Mars, including propellant tanks and the cruise low- and medium-gain antennas. The star scanner and sun sensor, also located on this ring, allowed the spacecraft to know where it was in space by analyzing the position of the sun and other stars in relation to itself. The cruise stage had two antennas that were used to communicate with the Earth. The low-gain antenna was omni-directional and was used when the spacecraft was near the Earth. Because it radiated in all directions, the low-gain antenna did not need to be pointed at the Earth to enable a communications link. The medium-gain antenna was a directional antenna that had to point toward the Earth for communications, but had more power to communicate when the spacecraft was farther away from the Earth. The medium-gain antenna acted like a floodlight and could direct the energy in a tighter beam toward Earth. Just as a floodlight directs more light into a focused area than a normal light bulb does out of a lamp, the medium-gain antenna could direct the data from the spacecraft into a tighter beam than the low-gain antenna.